We’re proud to be showcasing at Hannover Messe once again next week. Manufacturing continues to be one of the leading industries adopting IoT for a growing set of scenarios to improve safety, efficiency, and reliability for people and devices. Every year, I get to meet with partners and customers and learn about how their needs and use cases are growing and changing as they continue to digitize their operations and deliver on the promise of Industry 4.0. They want security more integrated into every layer, protecting data from different industrial processes and operations from the edge to the cloud. They want to enable proof-of-concepts quickly to improve the pace of innovation and learning, and then to scale quickly and effectively. And they want to manage digital assets at scale, not dozens of devices and sensors. Over the last year, we’ve made several significant additions to our IoT platform to address these needs, including the launch of Azure Digital Twins and Azure Sphere and the general availability of Azure IoT Central and Azure IoT Edge. Next week at Hannover Messe, we’re introducing a set of new product capabilities and programs that make it easier for our customers to build enterprise-grade industrial IoT solutions with open standards, while ensuring security and innovation protection across cloud boundaries. Securing IoT solutions requires new capabilities to protect the thousands of devices deployed on the edge. To truly secure an IoT solution, you must secure devices, their connectivity to the cloud, the services running in the cloud, and the applications built on top of them. At Hannover Messe, we’re thrilled to announce Azure Security Center for IoT, the world’s first comprehensive security offering for IoT. 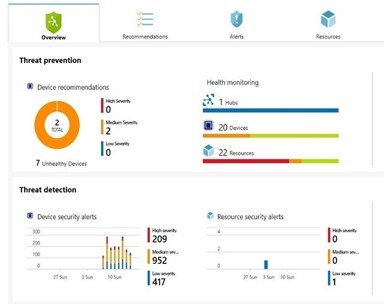 With Azure Security Center for IoT, customers can benefit from a holistic view of their IoT security and take measures aligned with industry best practices. The ever-evolving threat landscape requires customers to go far beyond this, by also inspecting and monitoring the security properties of devices and workloads for potential attacks. Azure has unique threat intelligence sourced from the more than 6 trillion signals that Microsoft collects every day and makes that available to customers in Azure Security Center. Beyond the security posture management and threat protection capabilities provided in Azure Security Center, many SecOps teams rely on SIEM tools for advanced hunting and threat mitigation across their entire enterprise. At RSA earlier this month we announced Azure Sentinel, which is the first cloud-native SIEM offered by a major public cloud provider. 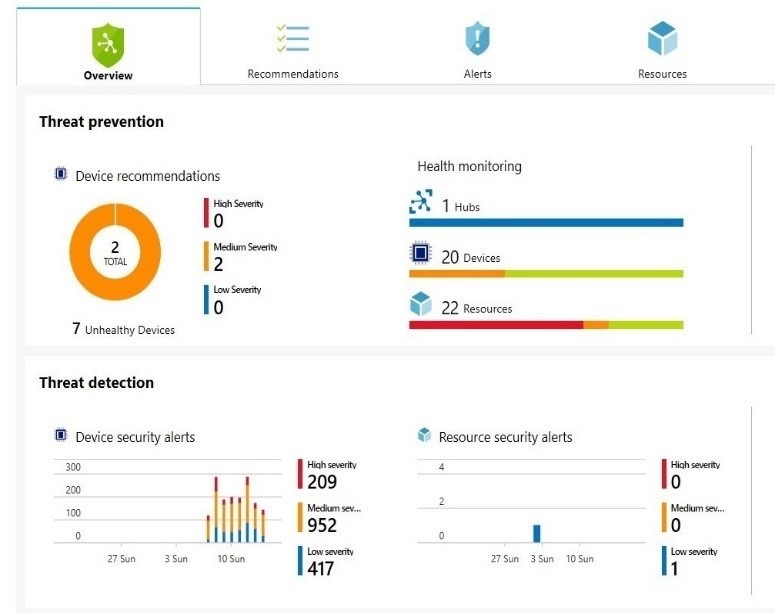 Today, we take it a step further by enhancing the capabilities of Azure Sentinel by enabling customers to combine their IoT security data with the security data from across the enterprise, and then apply analysis techniques or machine learning to identify and mitigate threats. This announcement empowers manufacturers to reduce the attack surface of Azure IoT solutions running across all their operations, remediate issues before they become serious, and apply analytics and machine learning to prevent attacks. Azure is the first major public cloud provider to deliver the breadth of these security innovations for end-to-end IoT solutions and this announcement marks an important leap forward as we offer new security layers for your IoT workloads. For more information watch our Channel 9 video. We also want to continue driving innovation in IoT, which requires us to take measures to protect our customers’ and partners’ innovations. That’s why today we’re extending the Azure IP Advantage benefits to Azure customers with IoT devices connected to Azure, and devices that are powered by Azure Sphere and Windows IoT. Thyssenkrupp, Bühler, and MediaTek are three companies that see the benefit of added protections from IP risk as they transition into Industry 4.0 and generate value from their IoT workloads. The program offers customers uncapped indemnification coverage for Azure Sphere and Windows IoT and access to 10,000 Microsoft patents that are available to Azure customers and can be critical in deterring competitors from suing for patent infringement. More detail about the new program is available on the Microsoft on the Issues blog. We’ve continued to innovate by developing additional open-source components based on open interoperability standards (OPC UA) for our open cloud platform. These new components provide security management as well as performance optimization and simplify the experience for our customers. Today we’re announcing OPC Twin, which creates a digital twin for OPC UA-enabled machines, makes their information model available in the cloud, and enables machine interaction from the cloud. We’ve also extended our OPC UA security and certificate management by launching OPC Vault. OPC Vault automates security management by creating, managing, and revoking certificates for OPC UA-enabled machines on a global scale. Both components simplify their integration into existing or new cloud applications by providing REST interfaces and are available on GitHub today. In addition, we’re excited to announce enhancements to the Connected Factory solution accelerator, which now also integrates an OPC Twin dashboard. Connected Factory is designed to accelerate proof-of-concepts in Industrial IoT and additionally offers OEE data across customers’ factories via a centralized dashboard. For Industrial IoT scenarios, time series data is a critical component to unlocking exciting opportunities to drive growth by providing operational insights in fractions of a second on a global scale. Later in the summer we will be building on our recent momentum with Azure Time Series Insights (TSI) by enabling our customers to take advantage of integrating both warm and cold path analytics into a single offering under the pay-as-you-go version that was announced in December of last year. This provides customers a more predictable, cost-effective, and flexible analytics platform for their Industrial IoT scenarios. We are also working towards delivering a wide variety of analytics scenarios by offering support for storage tier configuration based on retention and released enhancements to the user experience. Last year we announced Azure IoT Hub on Azure Stack in limited preview to meet industrial manufacturers’ latency and connectivity requirements, as well as their specific regulatory and compliance policies. Customers that are working with us are benefiting from running their IoT solutions on a hybrid model. Rockwell Automation has partnered with us to build IoT solutions that stretch from the intelligent cloud to the intelligent edge. It’s not uncommon to have facilities that are in remote areas or immersed in conditions that cause inconsistent network connectivity. Rockwell Automation is participating in the Azure IoT Hub on Azure Stack limited preview to extend a consistent solution at the edge of their production. Running IoT on Azure Stack in a hybrid model has also empowered ZEISS to continue providing clients with new insights about their products, production, and processes. ZEISS spectroscopy helps clients to optimize their processes based on valuable insights about their products and production, when they need it and where they need it – thanks to smart solutions and connected technology. Their solutions for the food industry provide real-time measurement of important quality indicators, such as fat, moisture, and salt content directly on the production line. This data allows production managers to optimize quality almost immediately, while enabling a more efficient way of using raw materials and energy. The data can also be sent to cloud, to have all important information about the status of the production line always available and everywhere you need it. It’s an exciting time to be a manufacturer, when you have the power of data and connected devices at your fingertips to drive real-time insights and actions. We hope to see you at Hannover Messe where you can see and learn more about these announcements as well as see partners and customers’ showcasing these solutions. We will be at the Digital Factory Fair in Hall 7 – stop by and meet us.